* beginning with the Instruction Modification Parameter (IMP). * hence the shortness of the IMP [Space]. * There are four stack instructions. * and replace them with the result of the operation. * The first item pushed is considered to be left of the operator. * Heap access commands look at the stack to find the address of items to be stored or retrieved. * To store an item, push the address then the value and run the store command. * which will place the value stored in the location at the top of the stack. * Flow control operations are also common. * as well as the targets of conditional and unconditional jumps, by which loops can be implemented. 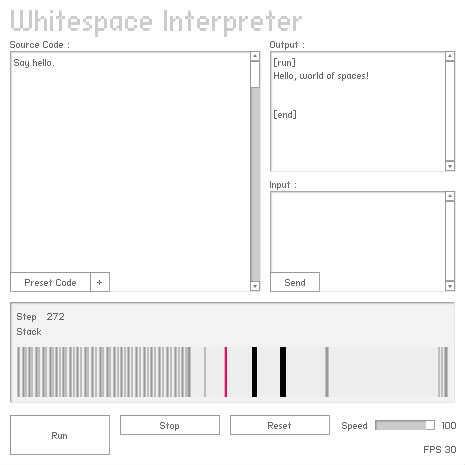 * Programs must be ended by means of [LF][LF][LF] so that the interpreter can exit cleanly. * Finally, we need to be able to interact with the user. * There are IO instructions for reading and writing numbers and individual characters. * With these, string manipulation routines can be written. * The read instructions take the heap address in which to store the result from the top of the stack. * terminated by a [LF]. [Space] represents the binary digit 0, [Tab] represents 1. * The sign of a number is given by its first character, [Space] for positive and [Tab] for negative. * Note that this is not twos complement, it just indicates a sign. * The only lexical tokens in the whitespace language are Space (ASCII 32), Tab (ASCII 9) and Line Feed (ASCII 10). * By only allowing line feed as a token, CR/LF problems are avoided across DOS/Unix file conversions. * (Um, not sure. Maybe we'll sort this in a later version. ).